Our history begins with Erastus Benson. Born in 1854 and raised and schooled in Iowa, Mr. Benson moved to Omaha in 1886. 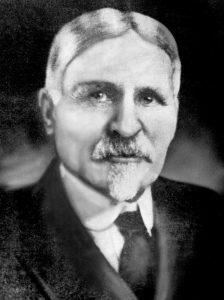 The following year, he purchased some 900 acres of farmland northwest of Omaha from John Creighton, a noted Omaha businessman and philanthropist. Benson Place, a suburb of Omaha, was platted on March 4, 1887. Mr. Benson’s application to run a streetcar line connecting the new suburb with the city was approved the same day. It’s said he attracted buyers to Benson Place by hiring a man to graze herds of buffalo along Military Road. In the early days of Benson Place, Mr. Benson donated land for the construction of a school, a town hall and an orphanage. In the late 1890s, Mr. Benson was a central figure in founding the first of the regional companies associated with the North American Phonograph Company – the Chicago Central Phonograph Company, along with Alfred Tate and Thomas Lombard. He later served as president of the Nebraska Phonograph Company. Mr. Benson was also an early investor in Thomas Edison’s Kinetoscope – which created the illusion of movement by reeling a flexible, perforated strip of sequential photographs past a light source with a high-speed shutter. 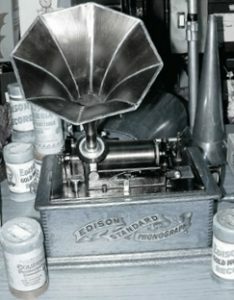 As president of the Nebraska Phonograph Company, Mr. Benson had an exclusive deal with Edison, which allowed the company to dominate phonograph sales throughout the Midwest for several years. During this time, Mr. Benson discovered Leon Douglas, a self-educated telephone operater who, at the age of 21, invented one of the first workable patents for a coin-operated phonograph. It’s said the nickel-in-the-slot phonograph was such a novelty at the 1889 Chicago World’s Fair that the exhibit raised $33,000 during its six-month run. 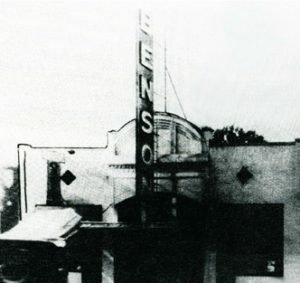 The Benson Theatre first operated as the Benalto Theater from 1923 to 1926. It could seat an assembly of 400 for vaudeville performances, film screenings and community events. From 1927 to 1953, the facility was part of a chain of neighborhood theatres owned and operated by Epstein Theaters. Following 1953, the building was home to a number of retail outlets, the last of which was Rick’s Fitness Warehouse. The Benson Theatre nonprofit purchased the building from a local developer in 2014. Above: historical photo of old Main Street in Benson courtesy of the Benson Historical Society. Do you have any information about the history of Benson Theatre or photos you could share? We’d love to hear from you at info@bensontheatre.org.